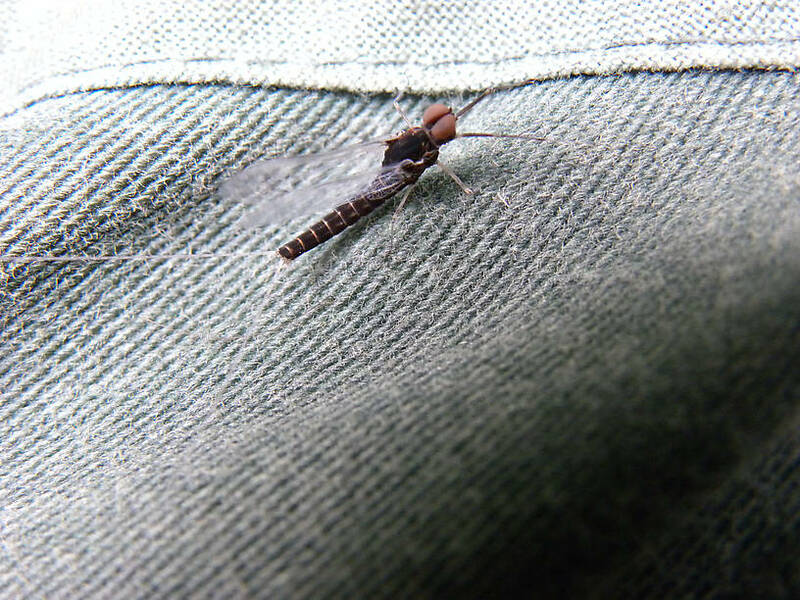 > Please help me ID this mayfly. 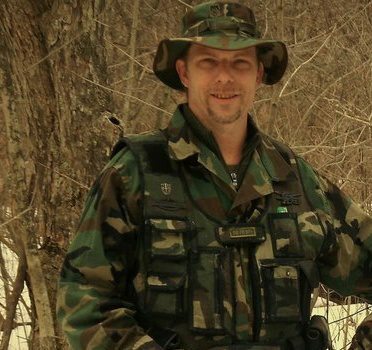 Posts: 10 I snapped this pic close to 100 mile house BC and would like to find out some more information about him. Spinners were sporadic around noon June 15 Unfortunately this is the only shot that I have. I would guesstimate him about a size 12. Any help is greatly appreciated. Welcome to the forum here at TroutNut. By the shape of the eyes, the dwarfed hindwing if I see it right, and the 2 tails I would say it is in the Baetidae family. If I am right there I would think it is a male Baites spinner. Soon the experts will join in and fill in the species. 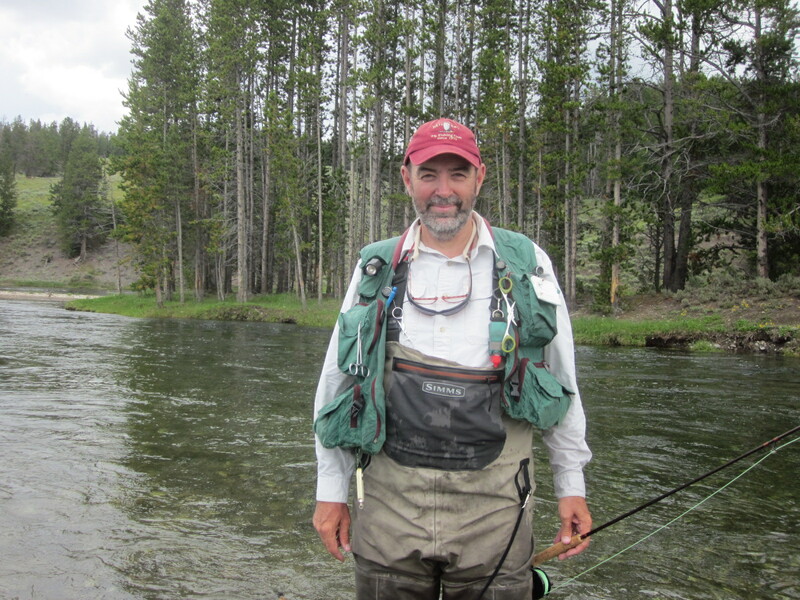 In common fly fishing names it would most likely be called a BWO or Blue Winged Olive. Posts: 10 Thanks for the reply Mack. I thought maybe B.Vagans but wasn't sure. UBC has 5 Baetidae species listed in their database but vagans was not one of them so I'm still not sure. Posts: 797 I am by no means really knowledgeable on these little guys but I am a good researcher. Baetis vagans is now Baetis tricaudatus and is a eastern species. It is in the west as Baetis tricaudatus but from what I am finding it more midwest and southern from BC. But that doesn't mean its not there. When Kurt gets back from his trip he will know which it is. From all the research sites I know of there are only two that are geographically yours for sure Baetis bicaudatus & Baetis persecutor. The male spinner for Baetis persecutor has a hyaline or whitish transparent abdomen from the 2-7 segment and the larva abdominal marking are not so much like yours. Baetis bicaudatus has a larva that has the right tegal markings but I can not find if the male spinner is hyaline. The ground color is darker rusty like yours and has the sublateral whitish tergal dashes. Most times I see that the markings in the larva are most commonly carried over to the adults. What appears to be highly unusual hind wing venation has me stumped. 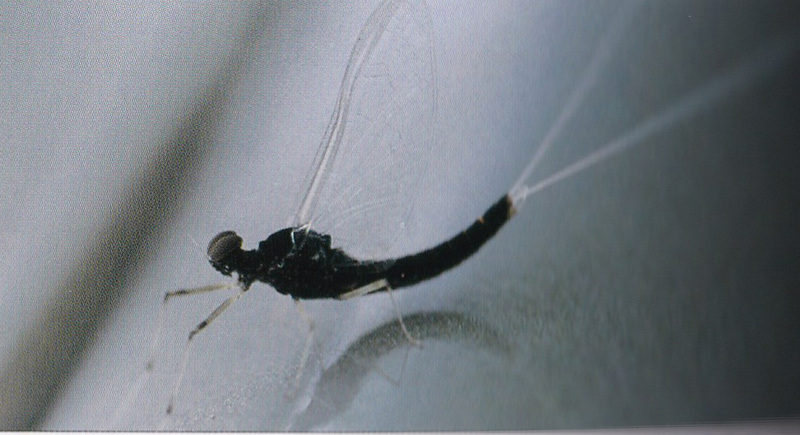 Baetis hind wings have few veins and even fewer crossveins. The "mosaic" look I'm seeing is entirely different. If it weren't for them I would think it one of many polytypical forms of B. tricaudatus. There is much to work out with western baetids in the Rhodani group, particularly with large solid dark abdomen specimens that keep showing up in samples of late from throughout the region. B. magnus and diablus are both examples of large dark baetids in this group that may eventually be considered forms of tricaudatus. B. tricaudatus is by far our most important western baetid. B. bicaudatus is a much smaller fly and usually has lighter tergal coloration on some segments as do the smaller forms of most tricaudatus. I am not too convinced on the size Kurt. If it is on some kind of denim like fabric I think it would be around 8 mm. Each of the fabrics rowed weaved lines look really big. So unless its on like some kind of heavy canvas weave I think it is around 8 mm. B. tricaudatus would be good for size ??? right. Posts: 10 Thanks for helping out guys. The pic was on my blue jeans. I just checked out the stitching with a pair of Verniers and each stitch is just over 3mm. Also elvevation was around 3000 ft. Hope this helps. "I believe this male imago to be Callibaetis ferrugineus hageni with unusually distinct abdominal banding." Except the abdominal and thoracic shape and color would be very unique as well. And the lacking of any speckles on the forewings makes Callibaetis a tough call. I'm not sure if its even a baetid at all. It could be a Paraleptophlebia of some sorts. Although the legs do look like Callibaebitis legs. I dont know. Posts: 797 Roger is correct. These are from Bold Systems biodiversity museum collection + a link. The female of this species does have mottled wings. Nice followup Mack. So we had, Washington, Ontario, and Northern CA...With a little nephew help from good old Idaho. By-the-way John...I need to PM you since I'll be out your way soon. I'll be staying in a cabin on Henry's Lake. Posts: 10 Thanks once again for the help. Initially I was going by information that I had from a bc gov website listing the genera , family and species. I have a number of periodicals (macafferty, haefel and hughes, knopp and cormier, schwiebert, meck etc.) which I tried cross referencing and found myself lost and that is the reason for my post. Posts: 797 I love trying to help ID stuff that is how I have learned what I have learned. Except the abdominal and thoracic shape and color would be very unique as well. And the lacking of any speckles on the forewings makes Callibaetis a tough call. It is not unusual for a Callibaetis ferrugineus hageni male imago to have completely clear wings, as can be seen in this photo scanned from page (66) of Phillip Rowley's excellent book, Fly Patterns For Stillwaters: A Study of Trout, Entomology, and Tying. Please also see this BugGuide post, which shows abdominal banding similar to Fredw's image. A tough call, but a good call. :) Thanks for the help with this one, Roger. As noted in my first post, those hind wings preclude Baetis. The eye shape is a good Callibaetis character too. I shouldn't have been stumped but the solid red/brown color (as appears on my iphone) fooled me into not considering them for some reason. Those rings also look unique for the genus. Male Speckled Spinners do have clear wings in some strains but are usually a dark sooty body color and have at least some body speckling in evidence. 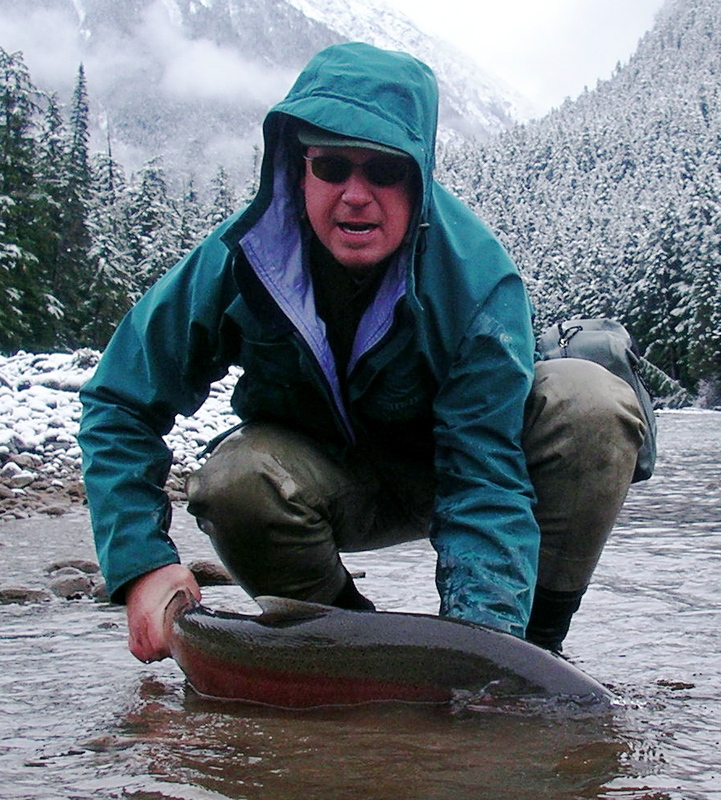 BTW - Phil Rowley's photos are probably from BC. Mack - Some strains of tricaudatus are over 10mm and others close to 5. Thanks once again for the help. Initially I was going by information that I had from a bc gov website listing the genera , family and species. The most comprehensive listing of North American mayflies for the province of British Columbia is available at N. American Mayfly Species Query. You need only select the Canadian province of BC, and then click the Search button at the bottom of the entry screen. That will take you to a screen which lists all mayfly species/subspecies "officially" recorded for BC. Clicking on the ? button for a particular species/subspecies will take you to a list of its attributes compiled from the entomology references in my entomology library. Of course, there are much more sophisticated searches which can be performed with this query, but that should at least give you a start. Posts: 10 Thanks for all the help guys. Now that it has been established as a Calibaetis what would we be calling it in laymens terms? Would it still be a BWO or maybe a mahogany spinner? On another note, I have a really neat pic(from the same trip) of a dragon fly sitting on the adjusting strap of my baseball cap. I am not really interested in a Latin name but maybe someone can direct me where to post if anyone is interested. Now that it has been established as a Calibaetis what would we be calling it in laymens terms? Would it still be a BWO or maybe a mahogany spinner? Re: Can someone please identify this insect?